Tucker Afraid To Accuse Michelle Obama of Pandering? 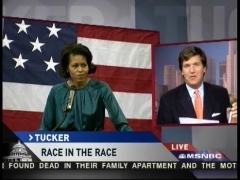 When one of Tucker Carlson's guests this evening ventured into the racial minefield that our political landscape has become, the show host chose not to join him on the perilous journey . . . .
Carlson began a segment by reading the recent statement by Michelle Obama displayed here. TUCKER CARLSON: I cannot resist putting up on the screen a brand-new quote from Michelle Obama which I think is interesting for a bunch of different reasons. This is apparently in a speech to a predominantly black audience, she said this, recently, quote: "We had a miraculous victory in Iowa . . ain't no black people in Iowa. Something big, something new is happening. Let's build the future we all know is possible. Let's show our kids that America is ready for Barack Obama right now." After Tucker suggested that, rather than blacks, Obama's core constituency consists of younger white liberals, and Dem strategist Peter Fenn made an appeal to soften the general tone, online columnist Bob Franken, something of a provocateur, weighed in. CARLSON: I think that's right. FRANKEN: Yeah, but when you have this Harvard [law school] graduate [and Princeton undergrad alum] using an expression like "ain't no," I've got to question the sincerity of it a little bit. I think she might be accused of pandering just a tiny bit. CARLSON: Well, there are many layers here that we don't have the time, or maybe the bravery, to delve into, but I want to get to Newt Gingrich . . . Interesting. When Hillary affected a southern accent speaking in black church in Selma a few months back, she was roundly criticized. Now granted, Tucker was dealing with the implacable clock, but did he speak the truth in acknowledging a lack of bravery in the matter?